They Achieved Their Goals and Won $100,000! Meet the Grand Prize Champions of the Beachbody Challenge 2017–2018! They achieved the most inspirational health and fitness transformations of the year with Beachbody’s proven system of fitness, nutrition, and support, and your votes helped them win more than $100,000 each! Indianapolis, Indiana (June 23rd, 2018) – The annual Grand Prize Champions of the Beachbody Challenge were announced this weekend in Indianapolis, live on stage at Lucas Oil Stadium. The $100,000 winners are Katie Green, age 25 from Sharpsburg, GA, and Jeff Rogers, age 29 from Medina, OH. Katie Green lost 115 pounds in 10 months and won $100,000! Katie Green started this journey at a whopping 276 pounds, and she was on the verge of developing type 2 diabetes. Her inspiration to get started ultimately came from her desire to have kids and become a mom. Her first step was reaching out to her Team Beachbody Coach, who set her up with a proven program for beginners, 21 Day Fix, which includes workouts you can do at home and a simple, portion-controlled nutrition plan. After completing several rounds of 21 Day Fix, and witnessing the results on the scale and in her energy levels, Katie advanced to a variety of other programs on Beachbody On Demand. 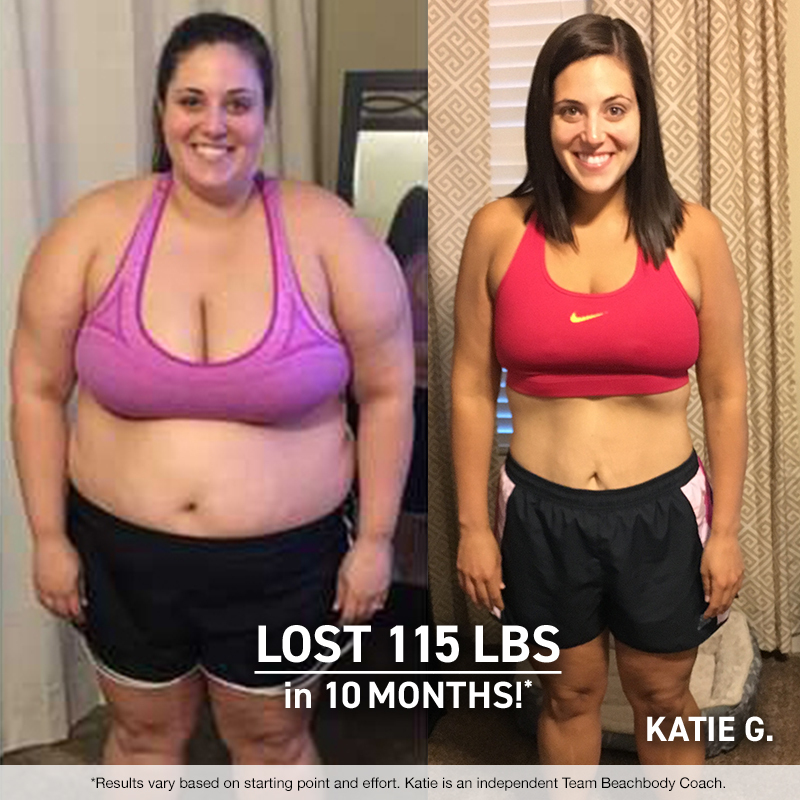 After 10 months of hard work and dedication to her healthy new lifestyle, Katie lost a total of 115 pounds and 8 dress sizes! Jeff Rogers lost 185 pounds in 13 months and won $100,000! But, he admits that he was a total novice when it comes to exercise. He wouldn’t have known where to start, he says, if it weren’t for an old set of workout DVDs that had been collecting dust in his closet for years. That program was none other than P90X, famous for its muscle-confusing variety of extreme, in-home workouts combined with a detailed but flexible nutrition plan. After 9 months of P90X (completing the program 3 times), Jeff had lost an astonishing 155 pounds! But he didn’t stop there. 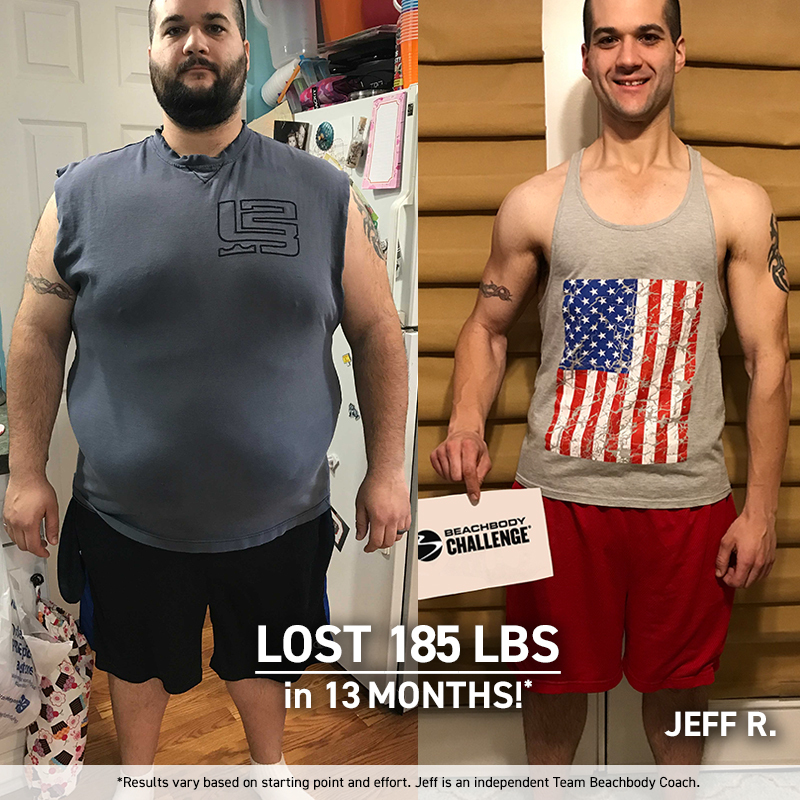 He doubled down on his effort by connecting with a Team Beachbody Coach, who plugged him into a community of support, Shakeology, and a variety of new programs to choose from on Beachbody On Demand. Overall, in 13 months, Jeff lost a total of 185 pounds and almost 20 inches off his waist! The Grand Prize Champions were selected from more than 60,000 contest submissions from satisfied customers who achieved their health and fitness goals. The decision was made, in part, based on the results of an online community vote. Consumers who participate in the Beachbody Challenge earn the chance to win prizes by submitting their personal success stories into the contest. To date, the Beachbody Challenge contest has awarded over $12M in prizes since its inception in 2007. The most common prize is a free gift,** like a T-shirt or a tank top, which every qualifying contestant earns as a reward for their hard work. But, the biggest and best prizes are awarded at the annual celebration event, where the top eight goal-getters of the year win some serious cash prizes live on stage. Next year (2019), for example, the prizes will range from $15,000–$50,000! But, the most important prize, according to many of the contest’s winners, is reclaiming your health and improving the quality of your life. Achieve your goals with any Beachbody program and enter your results at BeachbodyChallenge.com. We’ll send you a free gift,** and you’ll be entered for a chance to win big cash prizes! Void where prohibited. Open to legal residents of the 50 United States (incl. DC), Puerto Rico, the United Kingdom, and Canada who are Team Beachbody members and 18+ or the age of majority or older at time of entry. Ends 12/31/18. See here for official rules. *Results vary based on effort and Beachbody’s healthy eating plan. Katie and Jeff are both independent Team Beachbody Coaches. **Free gifts available while supplies last.